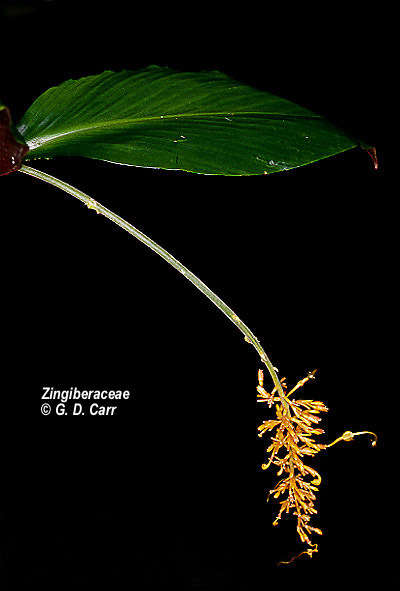 The Zingiberaceae are perennial herbs mostly with creeping horizontal or tuberous rhizomes comprising about 47 genera and 1,000 species. 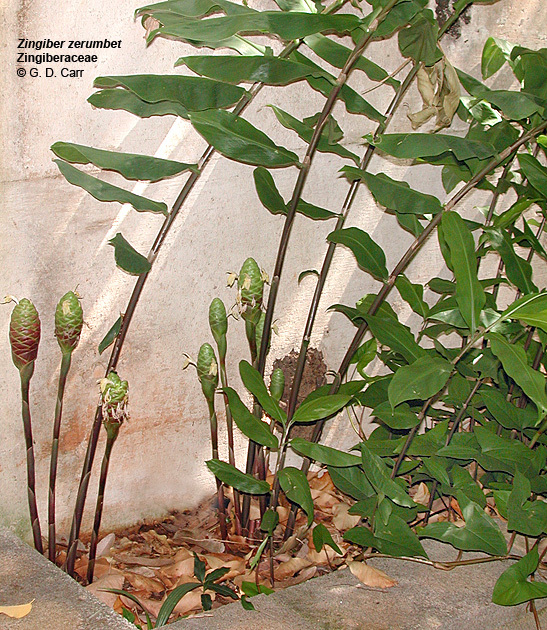 The leaves are alternate and distichous, the base sheathing and the blade mostly linear to elliptic with penni-parallel, strongly ascending veins. 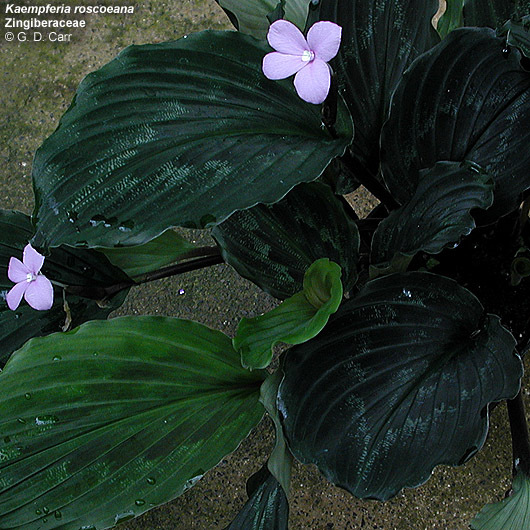 The flowers are bisexual, strongly zygomorphic, and often are associated with conspicuous floral bracts in a spike or raceme. 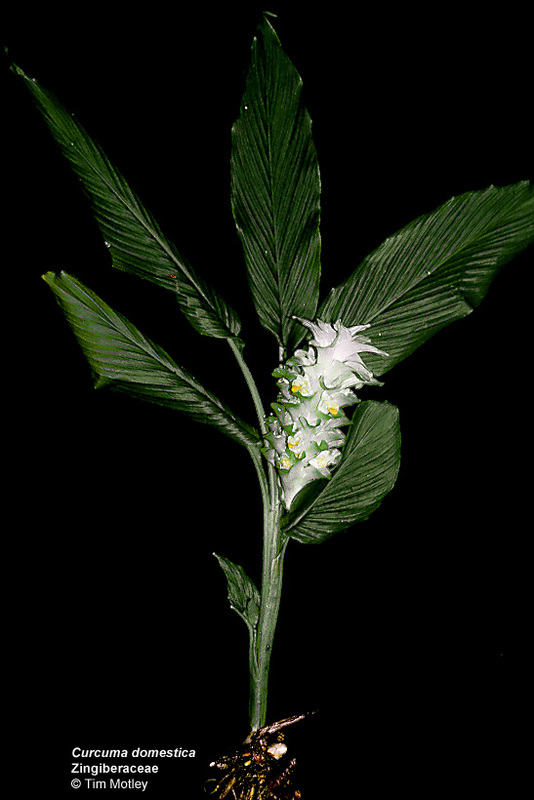 The perianth is in two whorls, an herbaceous or membranous 3-lobed or spathaceous tubular calyx and a petaloid tubular corolla with 3 lobes. 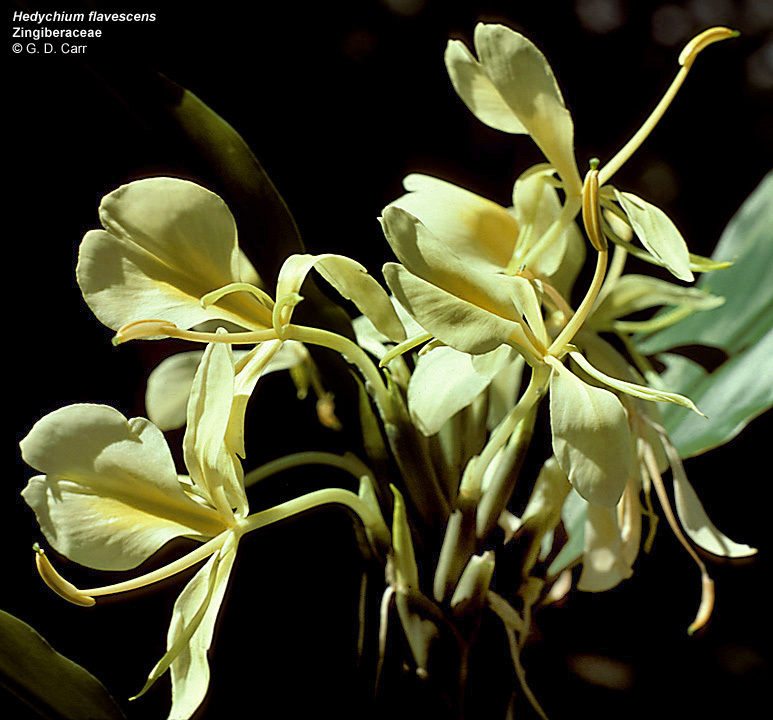 The androecium typically consists of 1 fertile stamen, a large opposing petaloid labellum representing 2 connate staminodia, and two smaller flanking petaloid staminodia. 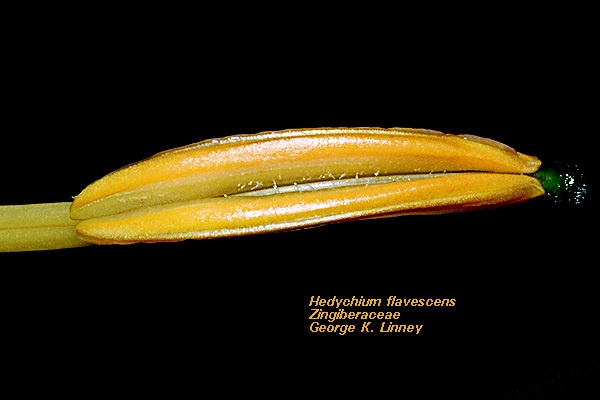 The gynoecium consists of a single compound pistil of 3 carpels, a single style nestled in a channel of the filament and anther of the fertile stamen and an inferior ovary with typically 3 locules, each containing numerous axile ovules. Rarely the ovary is unilocular with parietal placentation. The fruit is a loculicidal capsule or is berrylike. 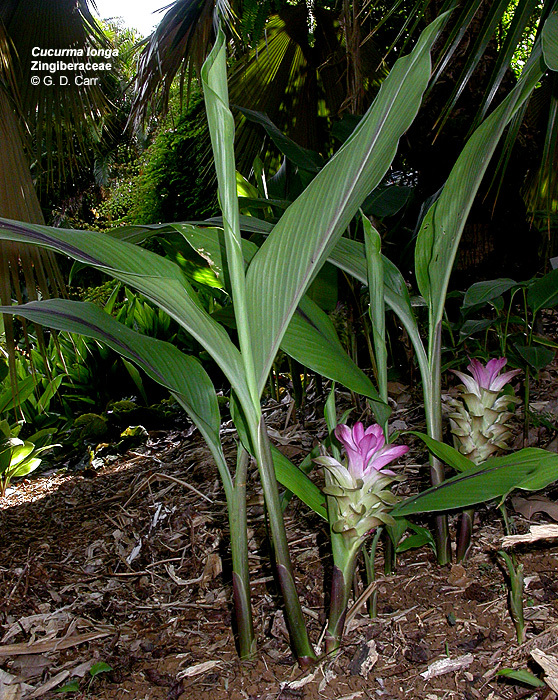 Alpinia nutans, shell ginger. 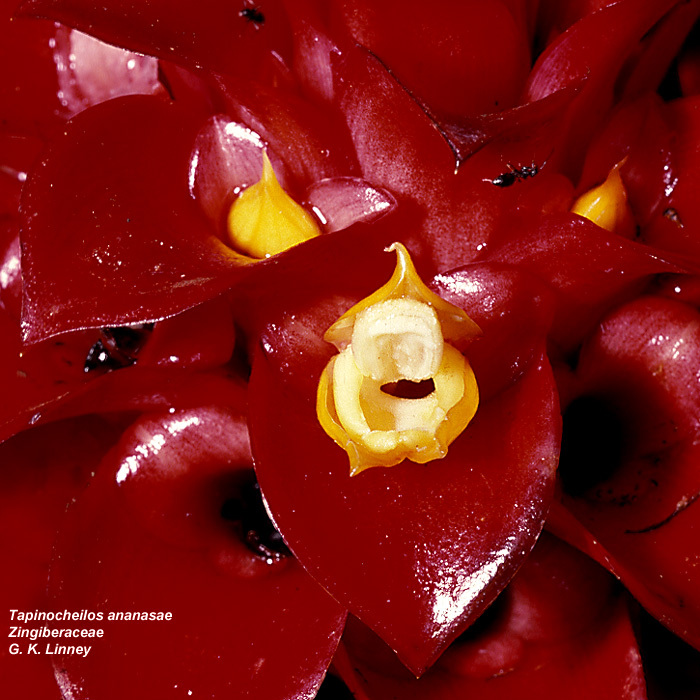 The most striking elements of this flower are the brilliantly colored staminodial labellum and the massive anther of the single fertile stamen. 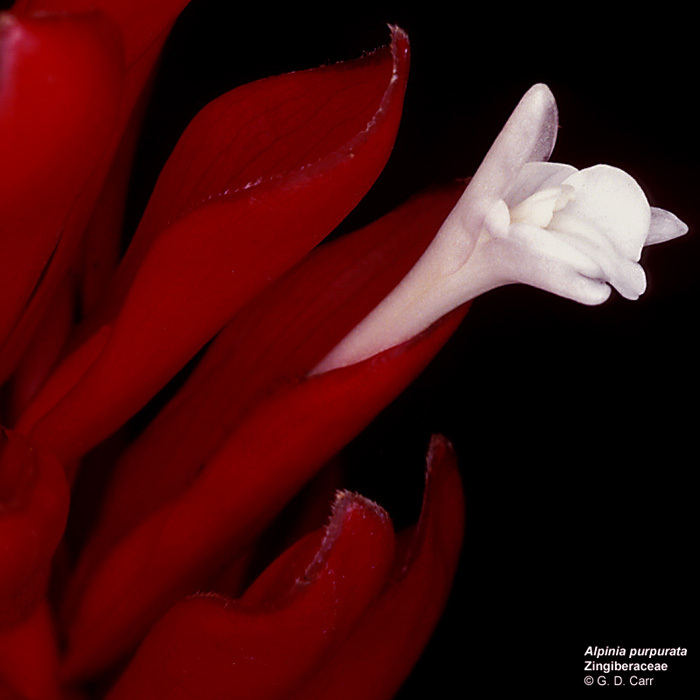 The globose, white stigma extends just beyond the tip of the anther. 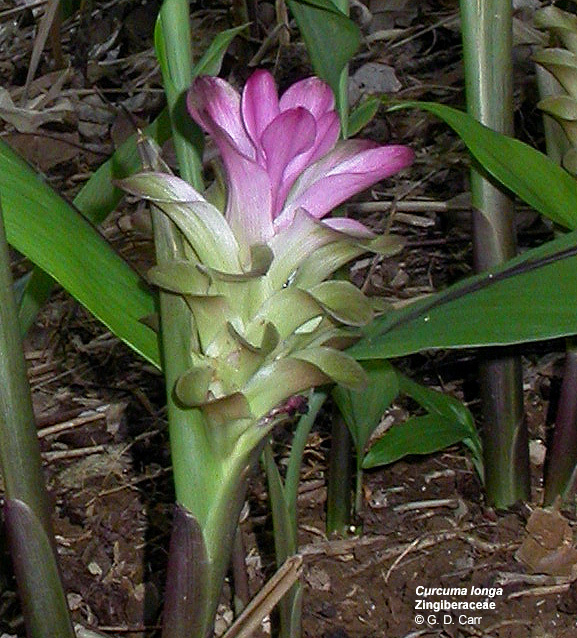 Alpinia purpurata, red ginger. 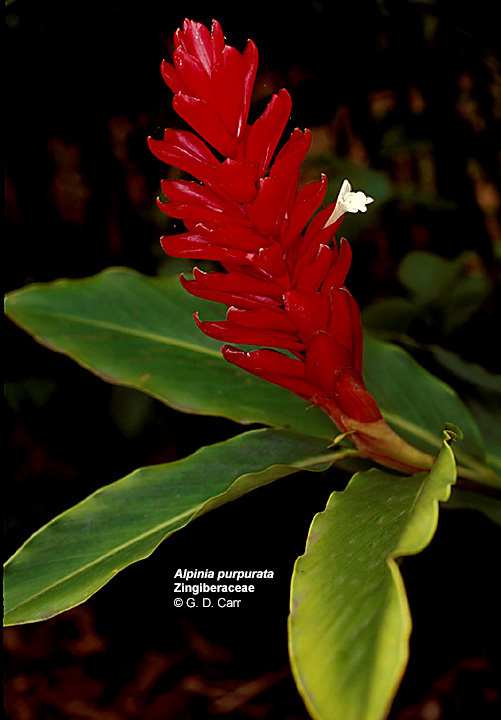 This photo shows the brightly colored bracts common in ginger inflorescences. 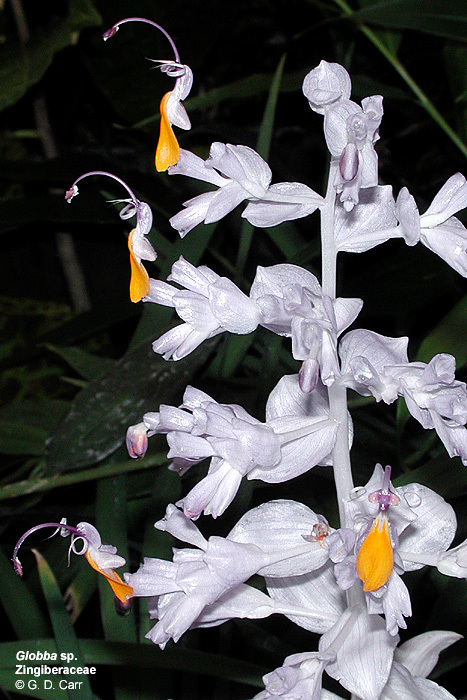 The inflorescence is quite showy even though only one flower is open. 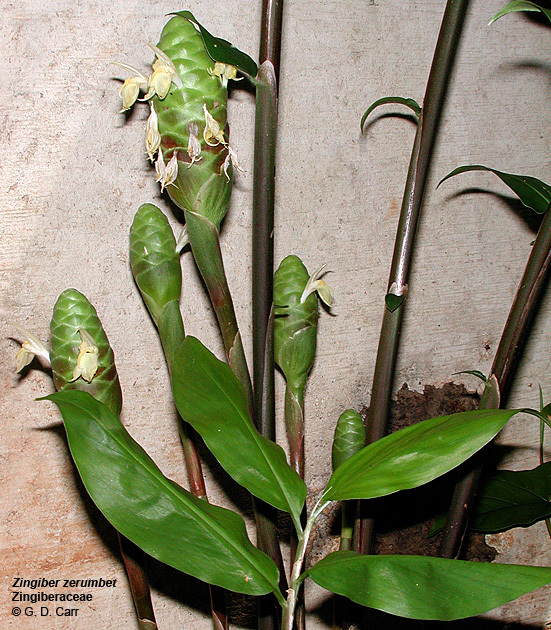 These are typical ginger leaves. 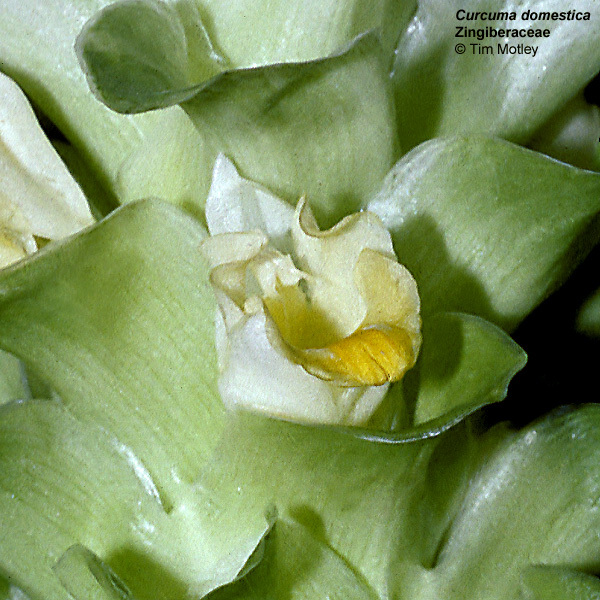 Note the parallel lateral veins angled strongly toward the leaf tips. 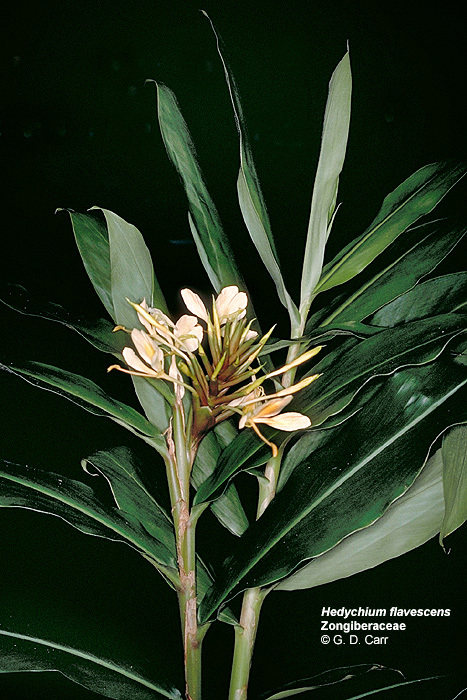 Alpinia sp. 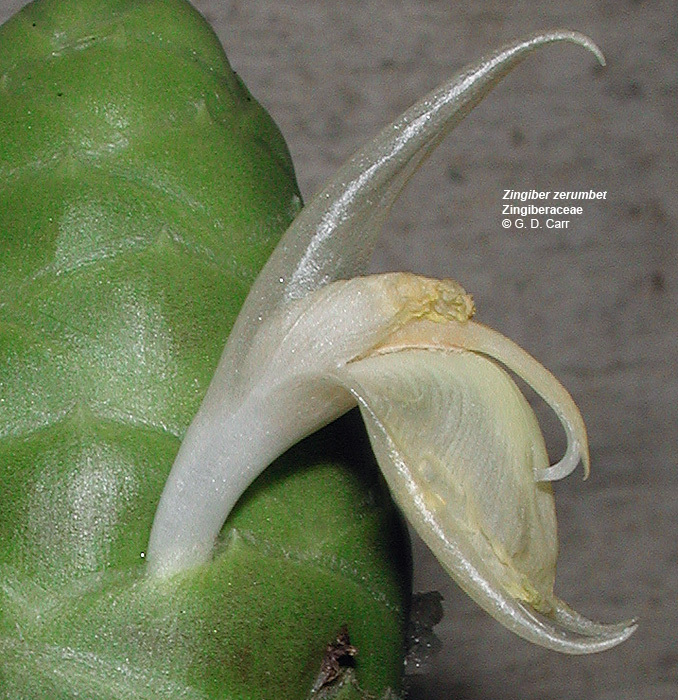 In this ginger the bracts are pink. 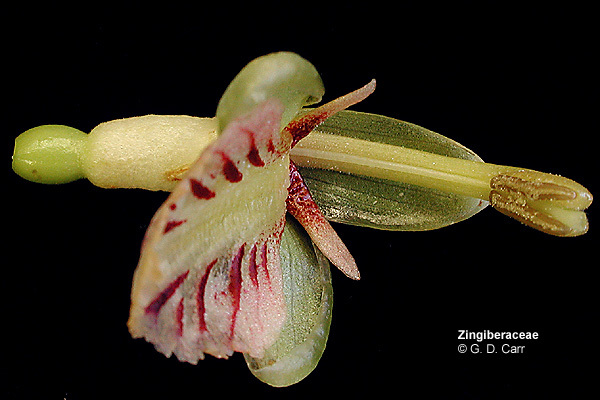 The single functional stamen is opposite the large, pink-tinged staminodial labellum. 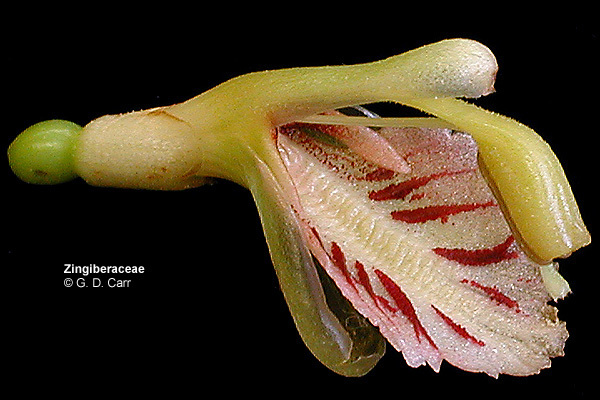 Two additional staminodia flank the fertile stamen. 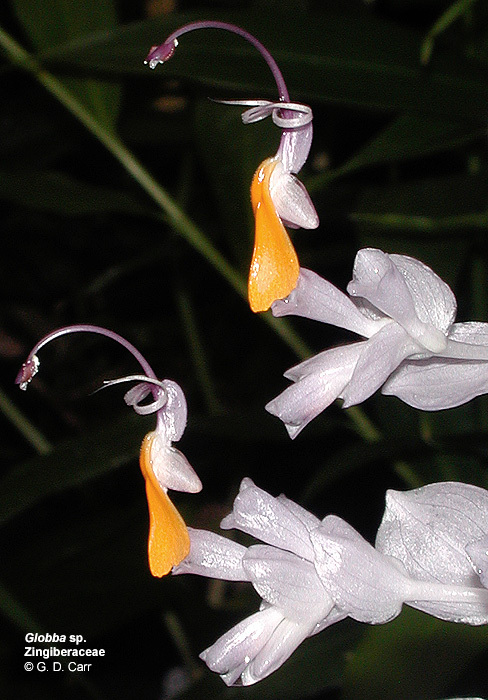 The outermost broadly triangular appendages are the corolla lobes. Globba patens. 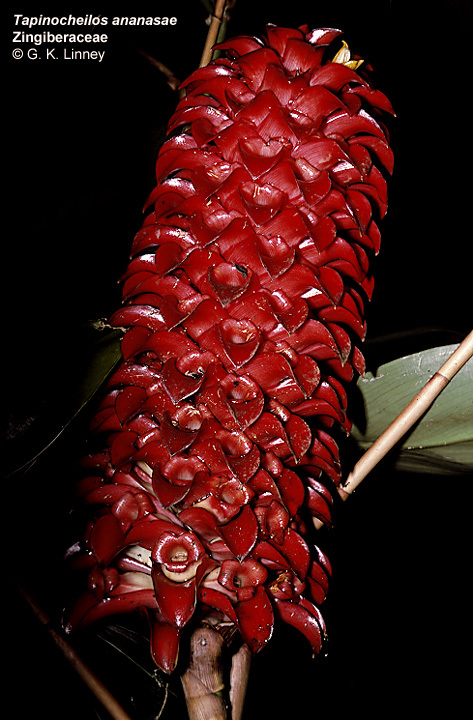 This curious ginger has an interesting floral morphology. 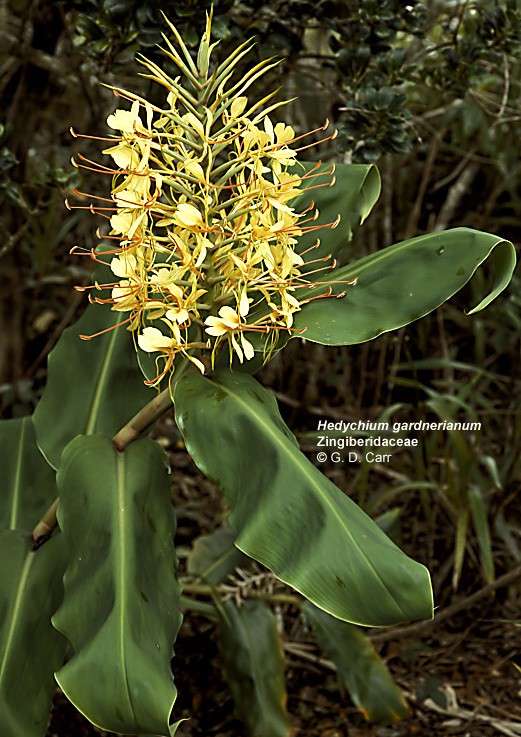 Hedychium flavescens, awapuhi melemele (yellow ginger). 1 - habit. 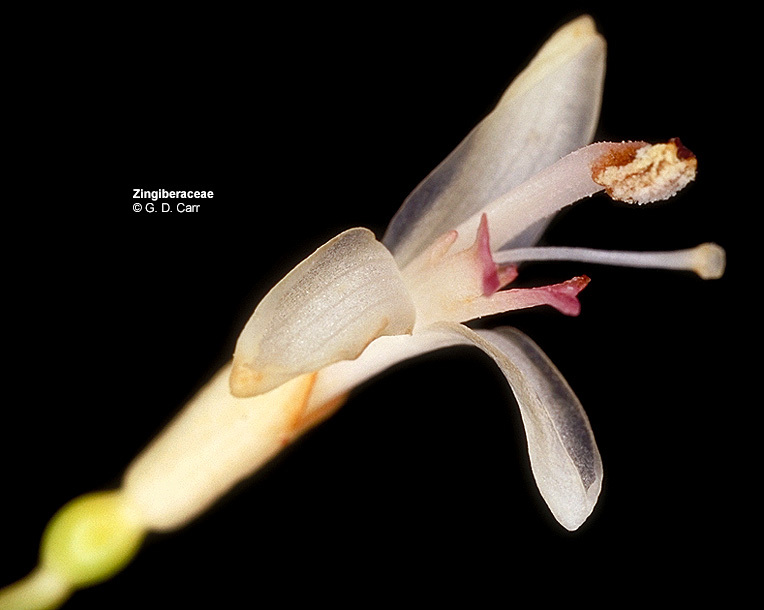 2 - Note the single functional stamen, the large 2-lobed labellum representing 2 connate staminodia, the 2 additional flanking staminodia, the very narrow linear corolla lobes, and the tubular portion of the corolla. 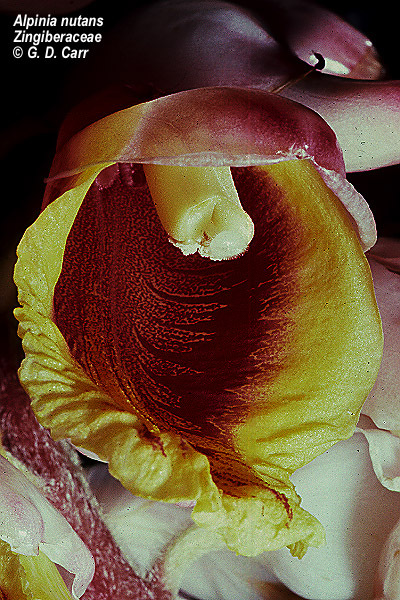 3 - This is a close view of the anther of the single fertile stamen revealing the slender style nestled in the groove between the orange anther sacs. 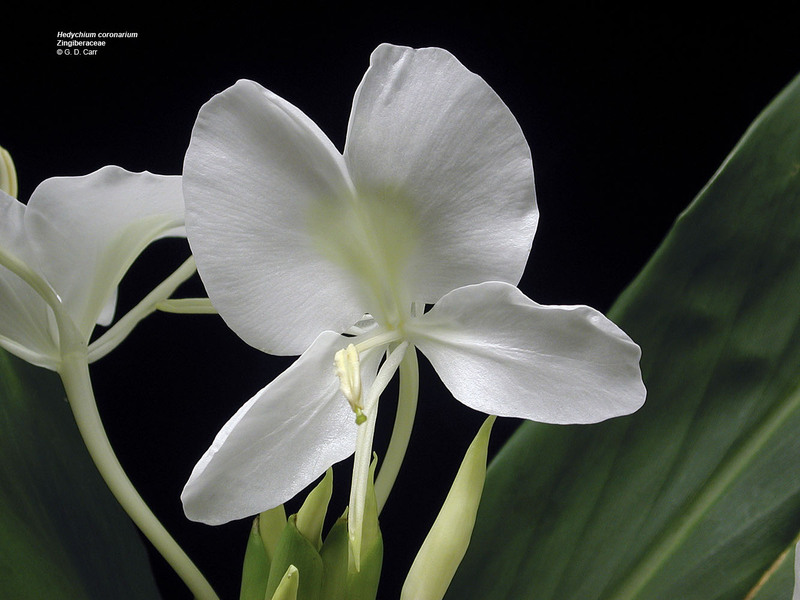 The stigma is protruding from the top of the anther at the right side of the photo. 4 - A sphingid moth that expired while "trapped" in the tube of the ginger corolla. 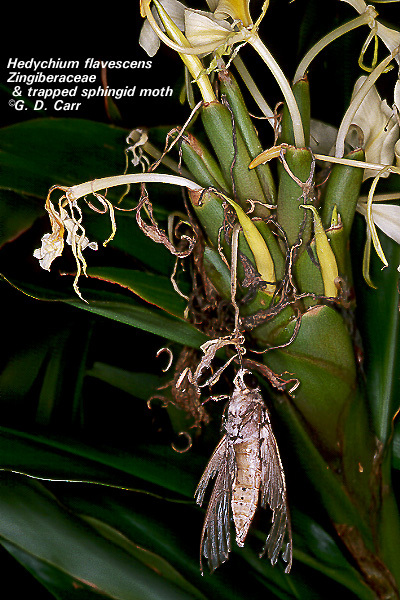 The moth's "tongue" was bent back on itself at the base of the tube so it could not be withdrawn. 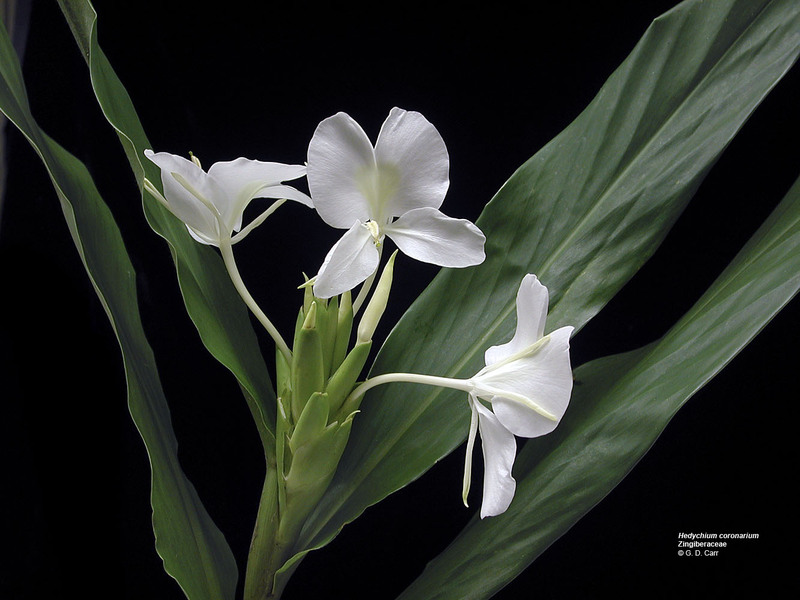 Hedychium gardnerianum, kahili ginger. 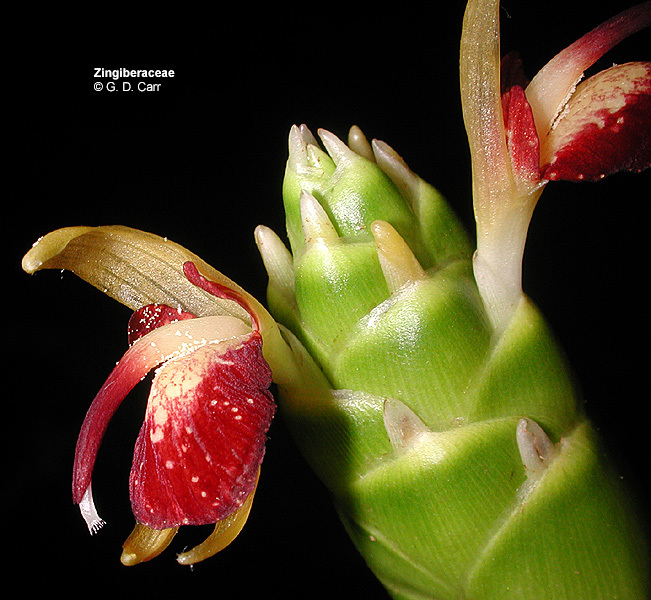 The flowers of this species are very similar to those of the yellow ginger. 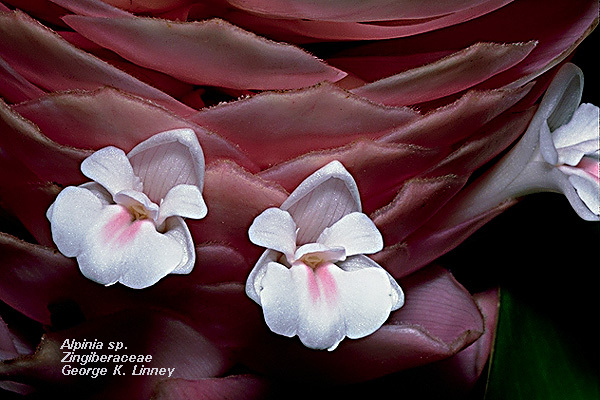 Zingiber zerumbet, shampoo ginger, St. John Courtyard, University of Hawaii, Honolulu, HI, Jun 2004.
ginger, This rather typical ginger flower exhibits an inferior ovary, tubular calyx, three lobed corolla, pinkish staminodes, a single fertile stamen, and style and stigma.